There is a rumor this "totally cool" (yes, pun intended) color might be discontinued. That would be a shame cause it is really a pretty one. Maybe I should get a backup. Anyway I have this color (*smug*) and it will last me for a while since I only visit it once a year or so. Milani Totally Cool is a sheer cobalt blue with tons of orchid glitters. It changes color under different lighting but mostly it looks purple with these two elements put together. I almost forgot about Totally Cool and I haven't worn this for a long time. The way these two eyeshadow shades look just made me think of this Milani polish! Now you know what I am going to show you next week! Ahhh pretty!!! This is definitely a color I'd wear as well! Marie Galante seems cool, but I heard it's better for layering. Can't wait to hear what you think! What a gorgeous colour! I think I would name it galaxy though, haha. The color is so vibrant and nice! Think this color can be easily incorporated with the fall colors! The polish and eyeshadow compliment each other perfectly. You gotta do a look with both! gorgeous palette and nail colour! hey lena! hope you're having an amazing weekend too! omg'd i love that color!!! why do they always discontinue the fabulous ones. it's different from any purple i've seen! great shimmer and punch to it. 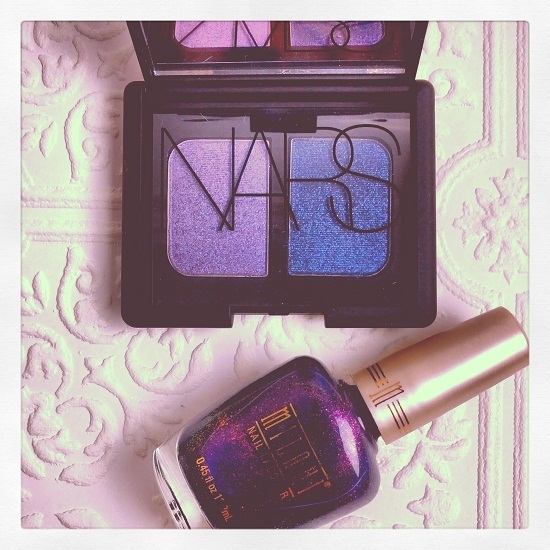 NARS makes fabulous shadow palettes. i love those two shades chickadee!!! They totally go together! I actually quite like that Milani polish - very shimmery, but also it looks like it has a lot of depth. And the color is quite unique, I feel - most purples are reddish and warm, like red grapes! He Lena, what a great match of eyeshadow + nail polish. I hadn't seen Totally Cool before, but it's a stunning color on you! o my god love the sparkles in it..love it! yes! i really love the cobalt blue sheer base. it is a bit hard to apply since it's so sheer but nothing you can't work with. i use eyeshadow primer like too faced shadow insurance. i hear urban decay one is even better for oily lids as well. Marie Galante is definitely on the sheer side and because of that, i don't think it was received well. ;) i knew what they were before my purchase thanks to all the blog reviews & swatches. i will do a look post soon! Hello gorgeous nail colour? I love this shade for fall, but the sparkles? That's a bonus! I love so much this shade, I like purple color!! hope you find one for yourself! ah..then i am afraid the rumor is true! it used to be in their core collection. omg its soo beautiful i love the multifaceted shimmer in it! what discontinued? i need to get it asap! !